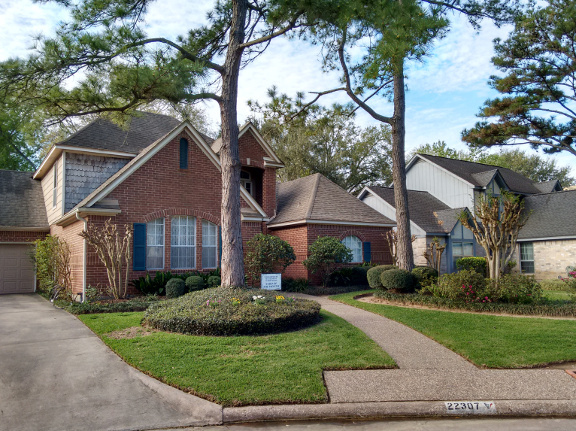 The yard-of-the-month for January goes to Michael and Tracy Vickery of 1602 Calveryman. The Vickery's have lived in Williamsburg Settlement for 27 years. They have 2 adult daughters, Lauren and Olivia. When asked why they like living in the Settlement they said "The Settlement is the perfect name because to this day it feels like we live in a small community where everyone is friendly and looks out for each other." The Vickery's yard is beautifully manicured and green, even though it is winter. There are two sago palms in the flower bed at the street. The front beds around their home have perfectly shaped boxwoods, holly, chrysanthemums and also crepe myrtles. At the lovely decorated front door you find two planters filled with red hyacinths. Many thanks to Michael and Tracy for contributing so much beauty to our neighborhood. 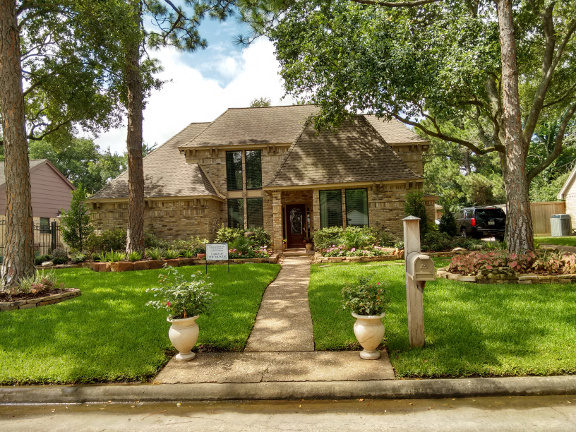 The Yard of the Month for February goes to Tomas and Lucy Diaz at 1706 Durfey Lane. The Diaz’s have been residents of the Settlement for 38 years. They came to visit friends in the “New Settlement” and fell in love with the neighborhood moving in a few months later. They are both retired now and love to travel visiting a different country each year. They love how serene the neighborhood is and how beautiful the homes are. Tomas and Lucy have 2 grown daughters, Maria and Linda, 4 grandchildren and 2 great grandchildren. Their immaculately kept yard has a stately oak they planted when they moved in, crepe myrtles that bloom in lilac, with ligustrums, holly berry, pansies and well-trimmed boxwoods across the front of the house. Around the oak are yellow and purple pansies with a border of ivy. Lucy loves to visit Nelson’s nursery to learn and shop for plants while Tomas still attends the Katy football games. Thank you Tomas and Lucy Diaz for contributing so much beauty to our neighborhood. 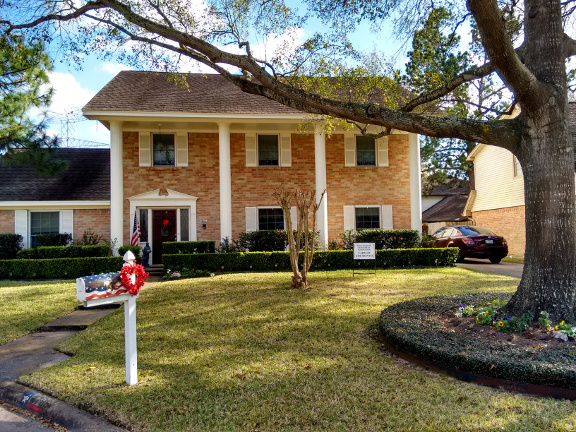 The Yard-of-the-Month for March goes to Andrew and Mindy Gertner of 22307 Unicorns Horn. 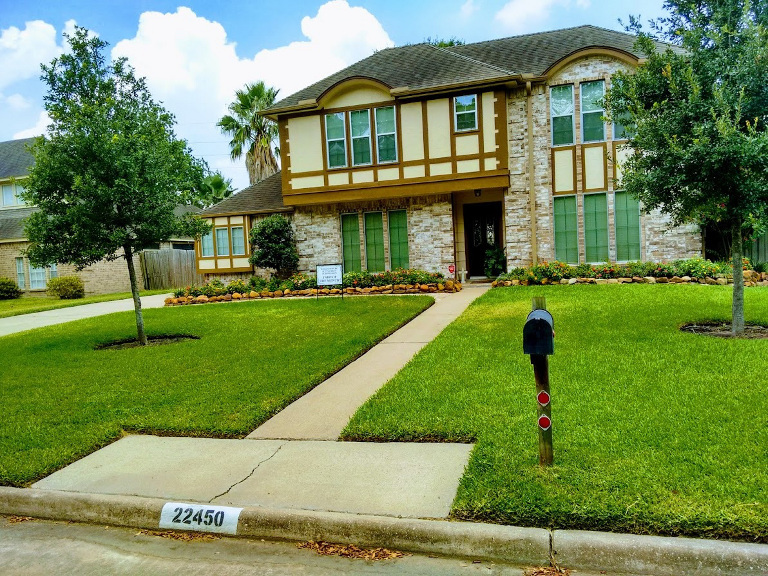 The Gertner’s have lived in the Settlement for 18 years and have one son Evan who graduated from Morton Ranch in 2016 and now attends Texas State University. Their favorite things about the neighborhood are how well the majority of the homes are cared for, the overall quietness and the location making it convenient to many local shops and roadways. Andrew and Mindy’s yard, who by the way love doing their own yardwork, is very well cared for with the front of the house and flower beds containing circular shaped boxwoods, elatior (cast iron foliage), ligustrums, azaleas, rose bushes, blue plumbago, crepe myrtles, asian jasmine and liriope as ground cover around the tree and beds. Congratulations Andrew and Mindy on winning yard of the month for March and thank you for adding so much beauty to our neighborhood. The Yard of the Month for April 2017 goes to Jim and Joyce Burrell of 22443 S. Rebecca Burwell. The Burrell’s have lived in the Settlement for 23 years and have 3 grown children Christopher, Michael, and Kalen. Asking Jim and Joyce what they love about the Settlement they replied that besides the large lots, friendly neighbors, well-maintained yards and the enjoyment they get from walking their dog, is that 2 of their children now own homes here also. The Burrell’s yard is beautifully edged and maintained with the front flower beds containing Azaleas, red roses, circular trimmed boxwoods and glory of the snow lilies. On the front porch area are two planters each containing red blooming cyclamens and a well-trimmed potted fir. The front yard is finished out with a large pine and oak. Congratulations Jim and Joyce Burrell for winning April 2017 Yard of the Month and in the continued pride you take in helping make the Settlement so beautiful. The Yard-of-the-Month award for MAY 2017 goes to George and Emma Storey of 1619 Calveryman. The Storey’s have one daughter and have lived in the Settlement for 8 years. Their favorite things about the Settlement are all the beautiful mature trees, friendly people, the security and how nice and well-kept our neighborhood is. George and Emma’s yard is perfectly manicured beginning at their mailbox edged in pavers full of periwinkles. Both oaks in the front are surrounded with pavers and filled with a combination of marigolds, vincas, and coleus. Their front flower beds are finished out with periwinkles, vincas, variegated flax lily’s, knockout roses, flat and circular boxwoods and crepe myrtles on each end. Their front porch entry is lined with two large pots of geraniums accented by two twisted firs, and a beautiful magnolia wreath finishes out the front door. Thank you, George and Emma for your contribution of such beauty to our wonderful neighborhood. Congratulation on being selected as our MAY Yard of the Month. The Yard of the Month for June 2017 is awarded to Frank and Janice Hosak at 22307 Bucktrout. The Hosak’s have lived in the Settlement for 38 years and have 2 grown daughters and 4 granddaughters. Over their 38 years they say they’ve seen many changes both within the Settlement and surrounding areas. What they’ve continued to love about living in the Settlement all these years is how wonderful our neighborhood has continued to maintain its family oriented growth. 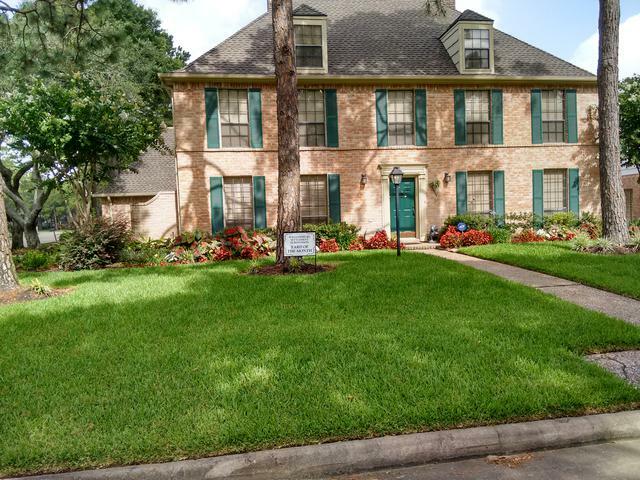 They love the beautifully maintained homes which they feel continue to encourage young adults to move here. They also appreciate the overall sense of security that’s enjoyed by so many as well as our wonderful neighborhood schools and the convenient accessibility of so many local establishments. The combination of all these benefits just makes this subdivision a wonderful place to live. One of the first things you’ll notice about the Hosak’s yard is the magnificent Oklahoma Choctaw Tan stonework rock outlining their flower beds. These beds are filled with a combination of Azaleas, foxtail ferns, geraniums, several Japanese berry trees, as well as a variety of other beautiful plants. Their oak and pine trees are also edged in Choctaw Tan stone and are surrounded with both caladiums and faux lilies. Planter pots filled with bougainvillea’s and croton’s accent both the sidewalk and front door entries. Congratulations to Frank and Janice Hosak for being Williamsburg Settlements June 2017 Yard of the Month winner. Thank you both for all the years you’ve helped to continually maintain the beauty of our wonderful neighborhood. The 2017 JULY YARD OF THE MONTH goes to Pam Moore and her late husband Jim at 1503 Earl of Dunmore. The Moore’s moved into the Settlement 28 years ago raising their 2 grown sons here. Pam enjoys spending time with her sons and, when possible, her grandson along with enjoying the company of the many friends she has in the Settlement. The things that Pam said she loves about the Settlement still reflect on why they chose to buy a home here. She loves seeing our children riding bikes; residents walking; the many well maintained yards along with the peacefulness and safeness she continues to enjoy. She also mentioned that seeing more and more of our young teens working around the neighborhood brings back lots of memories of their earlier days. She says all this is what keeps her believing that we still live in the best neighborhood there is. 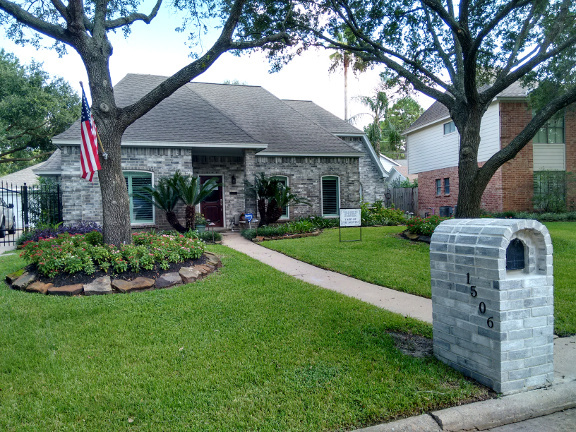 Pam’s flower beds on each side of her front entry are edged with colorful flagstone rock that have been filled with rows of begonias, caladiums, azaleas, day lilies, ginger, agapanthus, with foxtails, iris’s, boxwoods and 2 blooming crypt myrtles accenting her beds on each side. The front yard contains 2 huge pine trees and a magnolia. It’s a pleasure to have awarded Pam Moore our Yard of the Month Award for July 2017. Congratulations Mrs. Moore and thank you and your husband for your continued effort in enhancing the beauty of our neighborhood. 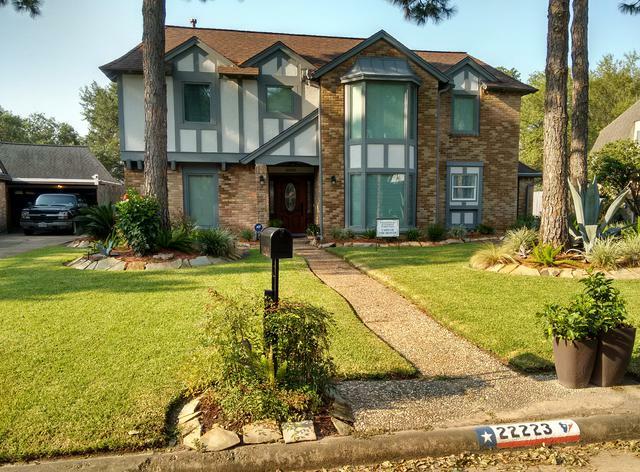 The Yard of the Month for August 2017 goes to David and Terri Youngblood at 22450 Wetherburn. David and Terri have lived in the Settlement for 31 years during which time they have raised 3 children - who have provided the Youngblood’s with 4 wonderful grandchildren. David is now retired from Katy ISD where he was a teacher, swim coach, and Assistant Principal at Taylor High School. Terri still works for Katy ISD and is going into her 41st year at Katy High School. The Youngblood’s yard is beautifully maintained both front and back. As you approach the front entry to their home each side of the walkway is outlined with stacked “moss rock” stone bordering beds which contain a variety of beautiful blooming plants. These include zinnias, lantana, coral dwarf roses, marigolds, philadandrums, circular boxwoods and ferns. One side of these beds is accented with a Japanese blueberry tree and the other with a crepe myrtle. Between their sidewalk and drive is an elegant paved walkway. The two oaks they have in their front yard are called “Cathedral Live Oaks”. These will always have a consistent height, shape, and spread versus your common live oak. Asked what they liked about the Settlement they replied that it is the people; the landscaping: the trees within our community as well as the spacious family sized homes and low noise level. The combinations of these things make the Settlement feel friendlier than your typical subdivision. On behalf of everyone living in the Settlement, our thanks to David and Terri Youngblood for winning our August 2017 Yard of the Month, Congratulations Mr. and Mrs. Youngblood! The September’s 2017 Yard of the Month is awarded to Esther and Garry Wright of 22223 Bucktrout. The Wright’s, who originally hail from Scotland, U.K. taught Internationally in American and British schools in 6 countries before choosing the Settlement as their home 2 years ago. Esther is currently a physical education elementary teacher at the new British International School located on Westgreen and Franz while her late husband Garry prior to his sudden passing in June was its Athletic Director. 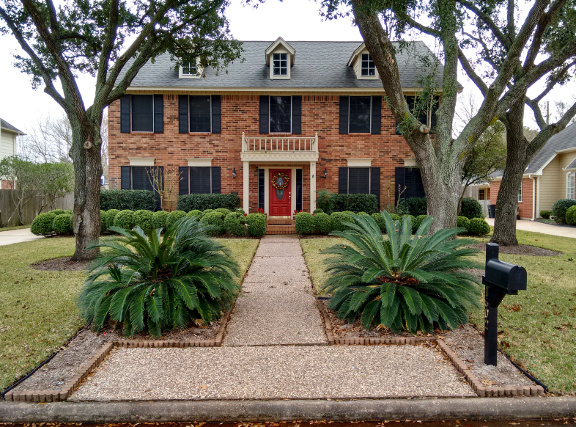 The Wright’s enjoyed working together in maintaining their well-manicured yard improving on many areas the previous owners had started but not finished. Esther still enjoys keeping up the yard work herself as she says it keeps her busy, challenged, and gives her the satisfaction of knowing she is doing her best to continue what she and Garry so much enjoyed doing together. The Wright’s yard is well laid out around 3 tall pines with precisely laid flagstone beds that include hibiscus, fox tails, pampas grass, roses, rosemary, ferns, a key lime tree, a sego palm, with the center of the main bed containing a giant Aloe Vera plant which Esther says keeps her busy just relocating all the little Aloe Vera sprouts! Two large potted hibiscus plants finish accenting out their yard at the sidewalk entry. Asked what her and Garry liked about the Settlement, Esther replied they fell in love with the quietness, safe feeling, their wonderful friendly neighbors, trees, squirrels, all the nice maintained homes and lawns. Esther says she plans on living in the Settlement for many years to come. Congratulations Esther and Garry Wright for being chosen Williamsburg Settlement’s September 2017 Yard of the Month. Your continued effort in helping to maintain the beauty of our community is greatly appreciated. Williamsburg Settlement Yard of the Month for October 2017 goes to Mike and Peggy Barnette of 1506 Calveryman. The Barnette’s have lived in the Settlement for 34 years where they raised 4 boys and 1 girl whose ages now span from 32 to 45. When they “throw in” their 4 grandchildren they have a full house come any holiday! After spending 45 years as a draftsman, with the last 14 at Cheniere Energy, Mike decided it was time to retire. Peggy on the other hand still works as a legal assistant downtown for McGuire Wood LLP. When not being “chief cook and bottle washer” Mike spends his time fine tuning and showing his ‘31 Model “A” Roadster at various car shows including several times at our mini car shows at the clubhouse. Peggy and a good friend have their own fiber arts company called “Skyloom Weaver” where they spin, weave, knit and dye their crafts for showing and selling at various craft events. The Barnette’s yard begins with 2 beautifully manicured oaks surrounded by stone edging filled with pentas. Their front and side flower beds lined with stone rock edging contain a variety of plants that consist of purple heart, hostas, asparagus and foxtail ferns, lirope, variegated ginger, hydrangeas, a plant called “Today, Tomorrow, and Yesterday” on which Peggy is patiently waiting to bloom. As you approach the front entry you’ll spot 2 very uniquely growing sago palms along with potted agapanthus and wandering Jew. Asked what each liked about living in the Settlement they both said the convenient location, the quietness, the new park and ride which Peggy uses for work and the overall beauty that exist throughout our neighborhood. As Mike calls it “Our Jewel in the Middle of Katy”! Thank You Mike and Peggy for adding so much beauty to our neighborhood. 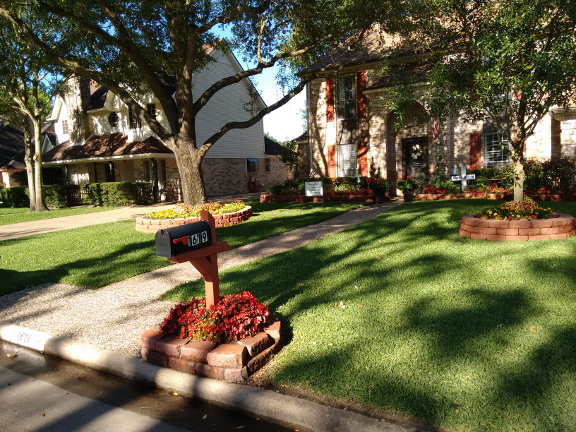 Congratulations on winning Yard of the Month for October 2017. The Williamsburg Settlement Yard of the Month for November 2017 is awarded to James and Kelly Simmons of 1718 Prince George Court. James is an engineer with Schlumberger while Kelly works downtown as an OB/GYN nurse at the Medical Center for Methodist Hospital. The Simmons bought into the Settlement just over 4 years ago due to Mr. Simmons being transferred to the Katy Schlumberger facilities. James and Kelly have truly enjoyed living on their cul-de-sac. They say having neighbors who are so friendly and outgoing has made their transition that much more enjoyable. They both say one of the things they like best about the Settlement besides their neighbors is it’s quietness, and James added that the closeness to his work which is just on the other side of Highway 99 and Colonial Parkway is a great advantage. 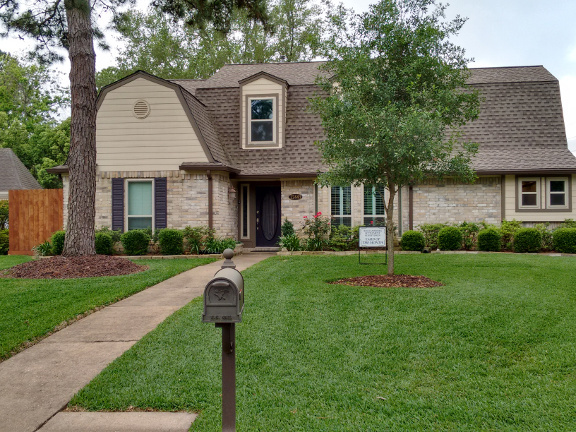 One of the first things you’ll notice when viewing the Simmons’s yard are the three tall trimmed pine trees that add an extra touch of beauty to their well-manicured yard. As you gaze towards their house you’ll see the equally well-manicured front flower beds on each side of their walkway both filled with rows of plumeria’s, variegated pittosporums and privets, loropetlums, azaleas, a few foxtails as well as a large Japanese Blueberry tree on one side and a beautifully trimmed wax leaf ligustrum on the other. The Simmons both say they enjoy the beauty of both their front and back yards. 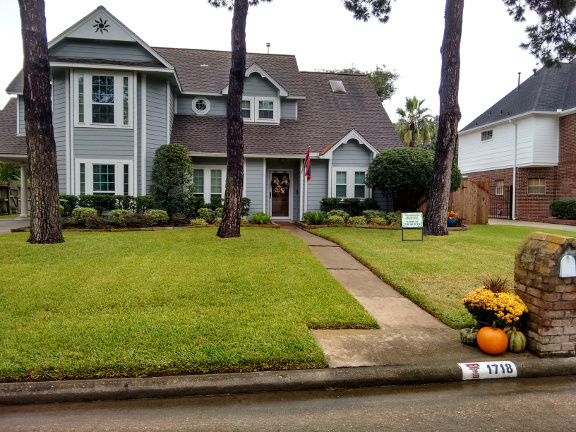 Congratulations James and Kelly Simmons for earning the November 2017 Yard of the Month award. Thank you both for your continued efforts in maintaining the beauty of our community.